It is important for released prisoners to continue participation in family strengthening programs and other social services after reentry (Bobbitt & Nelson, 2004; Kaslow, 1987; Meek, 2007). Continued participation may help encourage the use of knowledge and skills gained while incarcerated. Yet, prisoners are often released without links to community-based services. Human service agencies often have little connection with the criminal justice system and do not have formal mechanisms for sharing information about families in need. Resources may not be available to support community-based service delivery due to costs and uncertain release dates. Furthermore, inadequate understanding of post-release assistance entitlement can make transition planning difficult, and paperwork involved in connecting offenders with services in the community can be cumbersome and can take months to process (Rossman, 2001). Other barriers include lack of service coordination between community- and prison-based services due to long distances between the prison and the community where the family resides (and/or to which to prisoner plans to return) and different funding streams for programming within and outside of the correctional system (Bobbit & Nelson, 2004; Rossman, 2001). Providing a strategy to continue supportive services after release is crucial. 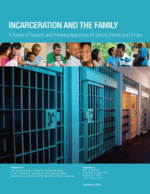 Ironically, many incarcerated fathers and their families come from disadvantaged communities that are involved with both the criminal justice and health and human services systems (Festen et al., 2002). Thus, more attention should be paid to how these disparate systems can intersect in disadvantaged communities to better meet the needs of families through improved service delivery. There are a few existing parenting programs that connect fathers with services in the community, such as job training, in order to prepare for reentry (Bowling, 1999; Jeffries et al., 2001). For instance, the Nontraditional Opportunities for Work (NOW) project represents a partnership between the Wisconsin Department of Correction and the Department of Workforce Development. This project combines support in areas such as parenting skills, child support, and paternity with assistance finding stable employment though training, education, and other services (Festen et al., 2002). Similarly, the Montgomery County Pre-release Center in Maryland provides information and training on employment in addition to guidance on parenting and family relationships (Jeffries et al., 2001). However, the impacts of such efforts on reentry success have yet to be evaluated.